This is a piece of Doncaster's cinematic heritage, back on public view for the first time in years - and now set for a major clean-up. 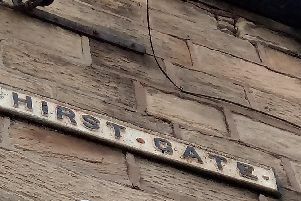 A 33ft long frieze, which used to don the front of the former Gaumont Palace, on Hall Gate, Doncaster, is now on display outside Doncaster Museum - but is showing the signs of having been left outside in fields for 10 years. Now it is set to be given a major clean-up by The Victoria Cross Trust, a charity which usually works to tidy up war memorials. The frieze has been put behind a secure fence outside Doncaster Museum and Art Gallery on Chequer Road, where the public can now see it again. More than 1,100 people signed the Cinema Heritage of Doncaster's group petition to save the 33 ft long sculpture, which depicted the story of film - from its conception by the author, to the writing of the scenario, the building of the set, through to the shooting of the film. It was removed from the cinema building before it was demolished in 2008 but campaigner Ron Curry, who worked as a projectionist at the cinema, tracked it down to a farmer's field in Doncaster, from where it was later moved to Rose Hill Cemetery. Mr Curry, who set up the Cinema Heritage of Doncaster group, is pleased to see the panels back on display, and would like to see them given a permanent home. He said he would like to see them included in the planned new Doncaster cinema at Waterdale, or the planned new Doncaster Museum, and would like to see them placed together so that each panel runs on from the next one, as they did on the former cinema building. He added: "If they could stay here at the museum I will be happy. They are great pieces of art, and there is very little of Doncaster's cinema heritage which has survived other than this frieze." The panels were too heavy and large to go inside the Museum, and are now in its grounds.. They are the work of Newbury Abbot Trent, famous sculptor who was a member of the Royal Academy, and depict the story of film, from its conception, the writing of the scenario, the building of the set and the shooting of the film. The Odeon cinema was demolished in 2008 and was due to be turned into a casino. But the site is currently just a car park. Victoria Cross Trust chairman Gary Stapleton said the charity would have a look at the frieze to see what work was needed and then carry out the work. He said: "We're pleased to do it because it is part of Doncaster's heritage."